The image above comes courtesy of @ferran_figufer who snapped this modified wing being run by Ferrari during Free Practice. As we can see not only has an additional adjuster been added (circled) the flap behind it has been cut away too. 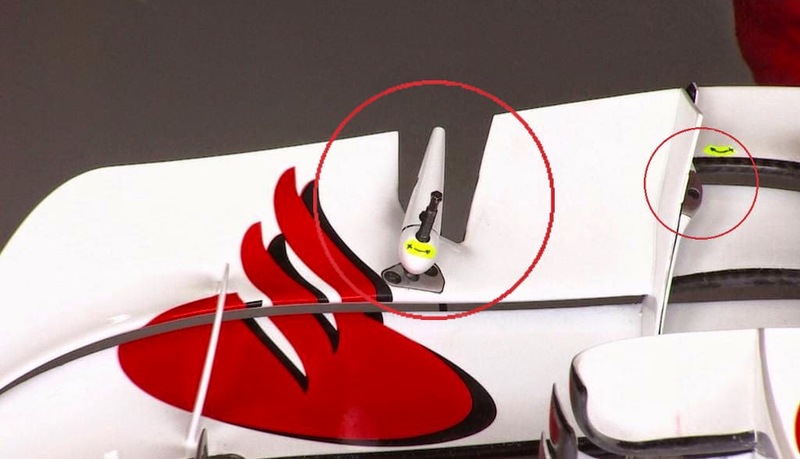 It seems that Ferrari may have been looking at developments for next season with this with the larger adjuster changing the main flap angle, whilst the inner adjuster (small circle) has been retained but now likely changes the upper/outer flap angle, which isn't currently viable (Perhaps allowing the team to trim how the outer profiles work in unison with tyre deformation, fuel load etc throughout a race) or is simply a relic of the older design this is piggybacking.